Mumbai:Yash Raj Films 'Thugs of Hindostan' promises to present audiences a jaw-dropping, larger than life, never seen before visual extravaganza. Having pulled off an incredible casting coup by bringing together two of the biggest legends of Indian cinema Amitabh Bachchan and Aamir Khan on screen for the first time, this film is the most awaited release this year on Diwali. 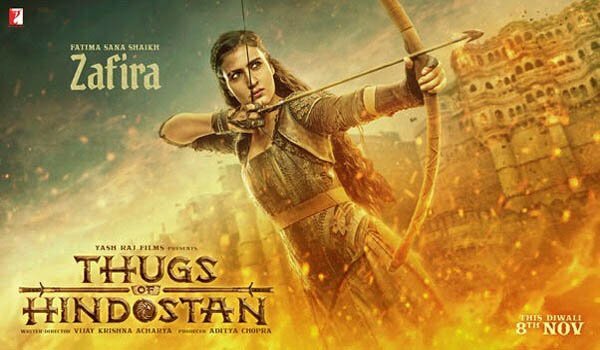 In keeping with the innovative marketing move to introduce the primary characters of the film through motion posters, YRF on Wednesday unveiled the first look of the skilled warrior Zafira played by Fatima Sana Shaikh.Zafira is fiery and stunning. She is an extremely talented fighter and specialises in combat by bow and arrow. Zafira has perfect accuracy and she doesn't miss a target, ever. Fatima Sana Shaikh as Zafira brings vigour and freshness to Thugs of Hindostan, the most anticipated film of the year.